The first day left us questioning whether we could complete the next ten. Everything hurt. Feet, calves, thighs, feet, shoulders, backs, feet, necks, feet, feet and every muscle in between. Muscles hurt that we didn’t even know we had. Did I mention feet? Especially our feet. One wrong turn three hours into the hike, and an already long and hard day of walking became longer and harder. 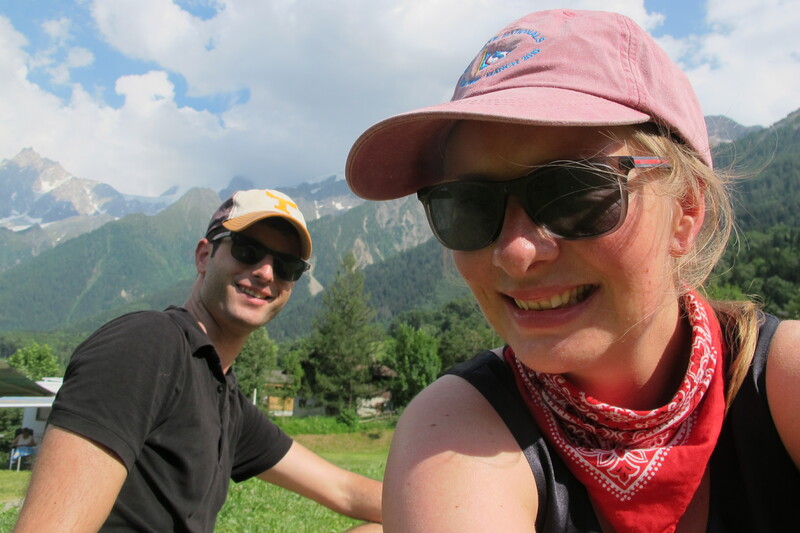 On the first, exhausting day of the Tour du Mont Blanc, we ended up walking over 21 kilometers on a day we were “only” supposed to walk 16. Within five minutes of the wrong turn, we felt as if we had made a mistake. The sign seemed to contradict the one we had just seen previously, but the map was of no help. There was no service on our cell phones, so GPS would not come to the rescue either. We even asked some of our fellow hikers, an Irish couple who had seemed to make the same mistake we had. The woman, fully confident, declared that we were headed the right way. We got on, lost sight of each other, and it soon became apparent we were both wrong. The first day seemed never-ending. Hours after that fateful wrong turn, when we finally got back on track, the campsite still seemed impossibly far away. And the signs (which, perhaps, should not have been trusted after pointing us in the wrong direction earlier) were not helping. At one point we came across a sign that indicated our campsite was 25-minutes away. After another 15 minutes of walking, we came across another sign, telling us the site was still 25 minutes away. I nearly broke down and cried right there. The craziest part is that we woke up early the next morning and did it again. 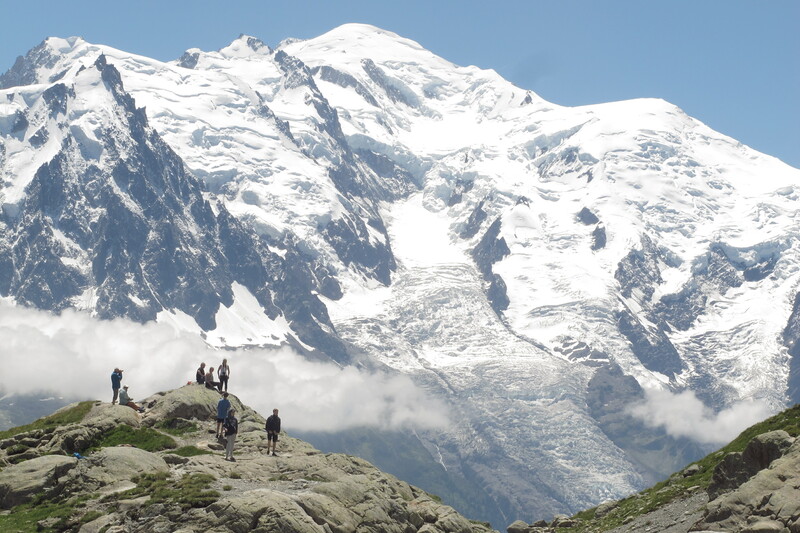 Nearly a year after completing the 11-day, 170 kilometer (106 mile) Tour du Mont Blanc hike, it is difficult putting the journey into words. Words and pictures just don’t give it justice. The Tour was more than a series of stops, more than a series of ascents over mountain passes, and more than the descents through ancient glacial valleys. It was more than the people we met along the way. It was more than the food and wine. It was even more than the sense of accomplishment of braving through it all. No, more than all of these things, it was the feeling we had along the way. Last summer I wrote about the freedom of disconnecting from technology (a freedom of which I do not allow myself to indulge nearly often enough). This hike took said freedom to the next level. Most places it wasn’t simply that we chose to disconnect, but rather that the choice was removed altogether. Miles away from anything resembling civilization, the cell reception was understandably sketchy. Even when we had a signal, why would we use it? The simple task of putting one foot in front of another, or, as became our battle cry, “kicking the mountain in the face,” was hard, but rewarding. And, like so few things in life, it was something we could control. We decided when to get up. When to go. When to rest. When to eat. And so on. Each day was hard, and brought with it a new challenge. On the second day we faced our longest and tallest ascent. On the third and fourth, long and treacherous descents left our legs feeling as if they were made of rubber, and our knees aching for relief. The fifth nearly stranded us without a place to stay, and would have done without a last-minute cancelation in a hostel (that was hours away from the next place to stay). Day six we fought our way through stinging wind and snow over the mountain pass between Italy and Switzerland. Day seven was supposed to be an easy walk through a mountain valley, though the most difficult portion was saved for last. The morning of the eighth day nearly broke us, with a steep incline, a lack of coffee, and poor conditions. 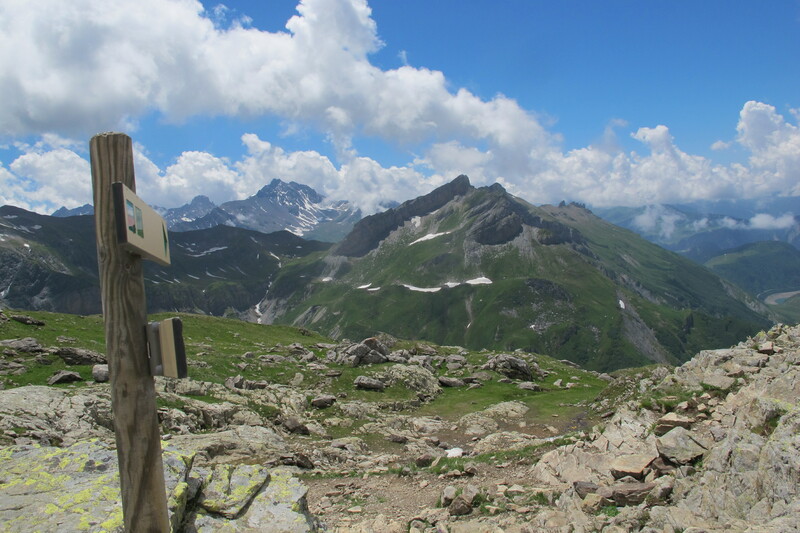 By day nine we had re-entered the Chamonix Valley, and we could almost sense our completion. And by the tenth day, we were buzzing, admiring the best views of the trip, ready to finish. The final day ended up being a bit of an anti-climax, but beautiful and fulfilling nonetheless. We were not out there alone. In fact, we met many friendly faces along the way. For those of us headed in the same direction (counter-clockwise in our case), we basically saw the same folks every day. It was a strange sense of camaraderie, but not unpleasant. Most of us will never see each other again, and yet for a week and a half, we were inexorably linked in our common goal. Ironically, of all the hikers to befriend, it was the Irish couple with whom we became the closest. After awkwardly running into them again on day two (they admitted embarrassment after accidentally sending us the wrong way), we started sharing food and drinks with them nearly every day. They even humored us by slowing down their pace once they caught up to us, something they managed to do, no matter how many hours of a head start we had, every single day. Each day was hard, but it got easier. The heavy backpacks seemed to weigh slightly less on our shoulders. Our feet weren’t quite as sore. Our breaks were not quite as numerous or long. And we weren’t getting lost nearly as often. Indeed, by the end we felt like “proper” hikers, just in time to finish. 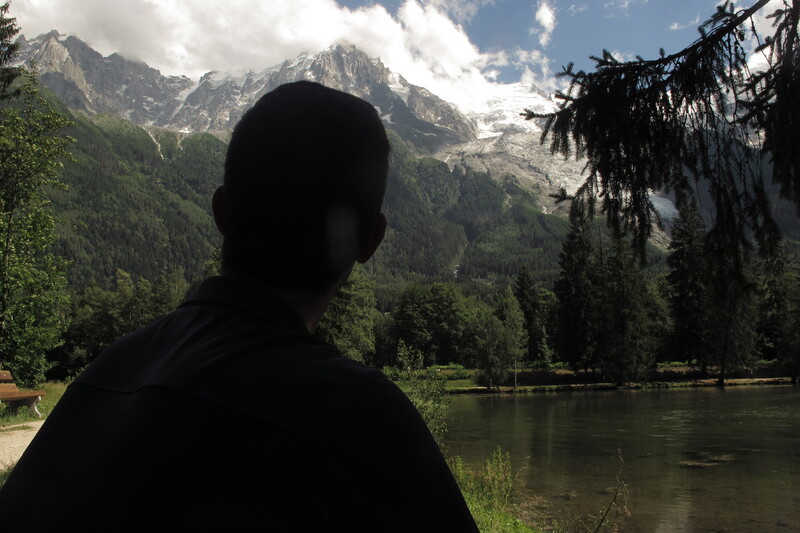 When we marched into Chamonix on the final day, we felt dirty and accomplished. The guidebook said that you could easily spot those who had finished the Tour, and those who had not yet begun. This fact was quite evident. After a (long overdue) shower, and a cheap (but fresh!) shirt we bought in one of the many local outdoors shops, we went downstairs to a cafe for a late lunch. And who did we see there? But of course, the Irish couple. That night we shared a final beer with a dozen or so accomplished hikers under the shadow of the towering and snow-capped Mt. Blanc. We said our goodbyes and went our separate ways, with no trail to reunited us the next day. Although we had two days left in Chamonix, we couldn’t help but feel slightly depressed the following day. We had nothing to do. We had no mountains to kick in the face. Never before had the cliche, “it’s not the destination, but the journey” been so apt. Whereas we had felt free from the burdens of society, just the day before, we now felt those burdens weighing more heavily on our shoulders than the bags ever had. Those thoughts–the subconscious to-do list always circulating in the back of your mind–had faded away, replaced only with the essentials: when to get up, when to break, where to sleep, etc. Those thoughts came storming back, making us appreciate the peace that only nature can afford all the more. Perhaps it is easy to romanticize it from a distance. It was hard work, even on the “easy” days. And yet, we find ourselves aching to go back, if not to Mt. Blanc, per se, another hike like it.